1. Store a copy of the repo folder, including the .git directory where git stores all state information it needs. 2. Do a git operation. 3. Compare the folder from step 1 with the current folder. Learn. We create a script cp_gitbydiff.sh which makes a copy of the directory containing a test repo. I kept the script in a directory which is in my bin path, so I could call it from anywhere. I use beyond compare as the diff tool, but any good diff tool will do. We use git init to create a repository. Now let us diff the repo directory gitbydiff and its initial (empty) contents gitbydiff_prev. The config file contains the default configuration for the repository. We can update the configuration using the git config command or by editing this file. The HEAD file contains a reference to the current branch, which is the master. The text in the file is ref: refs/heads/master. Let us add a file, and a directory with a file and add it to git. Diff reveals a few new files in the .git folder. An index file, and a few directories/files in the objects directory. How do we read these files? Turns out these are compressed files, which can be decompressed to reveal its contents. I borrowed a python snippet which can be used to decompress the file. So this was a compressed file with reference to a 'blob' with the contents of afile! The other object contains the other file bfile which we created. Git stores data as objects, which are key value pairs. The key is a checksum of the contents. Git uses SHA-1 hash to generate the checksum. In essense the index is a list of SHA-1 hashes, their paths and permissions. Let us commit our change to git. $ git commit -m "First commit from branch master"
In the diff we see three new objects, a log directory and a refs/heads/master file. So the refs/heads/master points to an object which in turn contains a pointers to a 'tree' object and the commit message. What is in the 'tree' object 631d1...? A 'tree' adir and a 'blob' afile. But adir and afile are the directory and file we created! 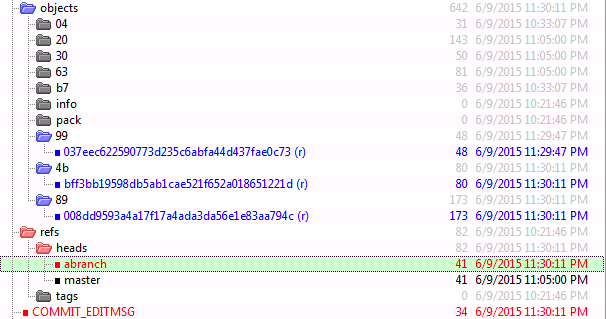 We can guess now that the contents of the 'tree' adir is a 'blob' bfile which is the file we created under adir. Let us check. From this we can infer that git stores a directory structure as a set of pointers with trees representing directories (and the root), and blobs representing files. The data structure used here is a Directed Acyclic Graph (DAG). We ignore the logs directory here. This is related to relog which we will not look into. Let us now create a branch. The HEAD file now contains refs: refs/heads/abranch. The refs/heads has a new file - abranch, which contains 20c9dc... which is the same as what the refs/heads/master contains. That is the object which points to our directory structure. This is logical: a new branch was created, git points its HEAD to it since we switched to it and the branch points to the root of our repo. Let us do a commit now. $ git commit -m "Second commit from branch abranch"
We see three new objects and that refs/heads/abranch and COMMIT_EDITMSG files has changed. What is git doing here? Since the new branch, abranch, has a modified afile it is updating the state of abranch to reflect this. It creates a new 'root' object which points to adir and afile. The new afile object that is pointed to is the updated file which is only in this branch. The master still points to the old afile. For adir/bfile, both master and abranch use the same object, since that directory has not really changed across the branches. Git does not duplicate data for common objects across branches. As a final step in our experiment let us merge the branch into the master. The HEAD is now ref: refs/heads/master. Nothing else changed. Though abranch is merged into master, its objects are left intact. I will stop at this point. This method can be used to explore other git commands like rebase or concepts like remote repositories. Another good source to learn more about git is by peeking at the git source code itself.